The global cruising industry has witnessed significant growth during recent years, with the number of cruise passengers exceeding the 20 million mark in 2012. 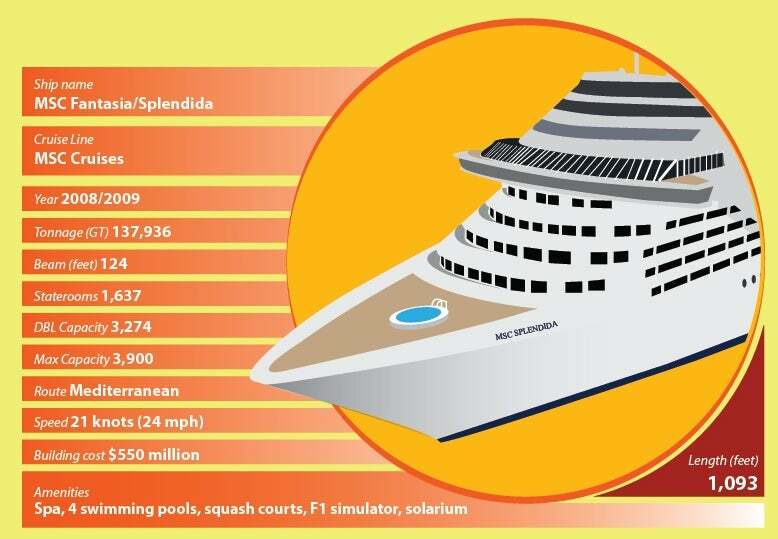 With the help of Cruise Kings, Ship-technology.com profiles the world's biggest cruise liners. Click on each image to see it full size. Oasis of the Seas and Allure of the Seas are owned and operated by Royal Caribbean International. Norwegian Epic was built at STX France's Chantiers de l'Atlantique shipyard in Saint-Nazaire, France. Freedom of the Seas, Independence of the Seas and Liberty of the Seas have the same gross tonnage capacity of 154,407t. The 151,400gt Queen Mary 2 entered into service in January 2004. Norwegian Breakaway is operated by Norwegian Cruise Line (NCL). 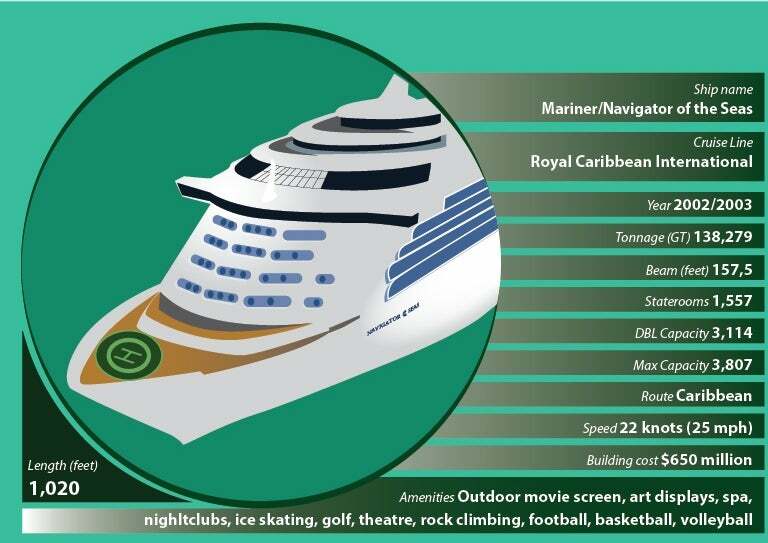 Adventure of the Seas cruise ship operated by Royal Carribbean Cruises has a gross tonnage of 142,000t. MSC Divina and MSC Preziosa are two identical ships operated on Mediterranean voyages. Mariner of the Seas and Navigator of the Seas were built at Kvaerner Masa yards, Turku, Finland. MSC Fantasia and MSC Splendida entered into service in December 2008 and March 2009 respectively. MV Ventura cruises at a speed of 22kt accommodating up to 3,574 passengers. Oasis of the Seas and Allure of the Seas are two Oasis class passenger ships owned and operated by Royal Caribbean International. The cruise ships were built by STX Europe at its Turku facility in Finland. Oasis of the Seas started its maiden voyage in December 2009 and its sister ship Allure of the Seas entered service in December 2010. Port Everglades, Florida, is the home port for the two ships. Both the vessels are 1,181ft in length and have a maximum beam of 213ft and draught of 30ft. The gross tonnage capacity is 225,282t. Eight Wärtsilä V12 diesel engines and four 7,500hp bow thrusters drive the vessel to a maximum speed of 22.6kt. 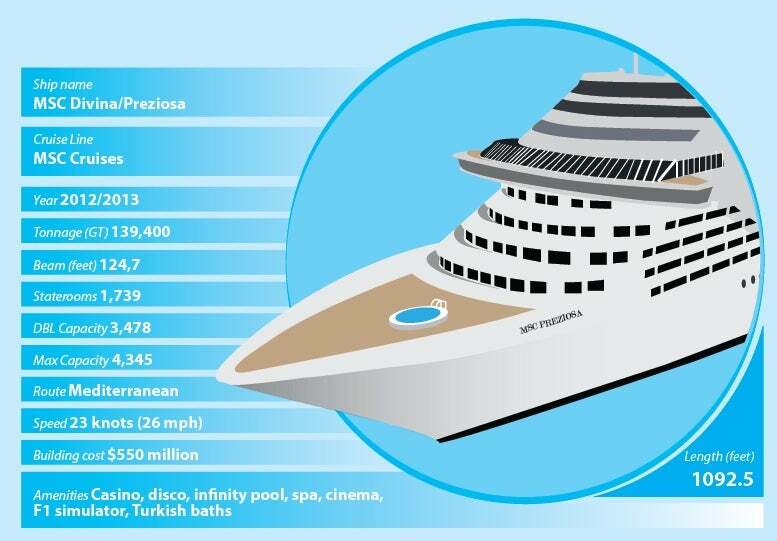 Each ship has 2,706 staterooms accommodating up to 6,296 passengers. Passengers can choose from a wide variety of accommodation options, including 28 two-level loft suites. Amenities include an amphitheatre, five swimming pools, rock-climbing walls, mini-golf, night clubs and casino. Norwegian Epic is owned and operated by Norwegian Cruise Line. STX France built the ship at its Chantiers de l’Atlantique shipyard in Saint-Nazaire, France. The cruise ship has been in service since 2010, sailing on both Caribbean (round trip from Miami) and European routes (round trip from Barcelona). It also started offering round trips from Rome and Marseille in 2012. 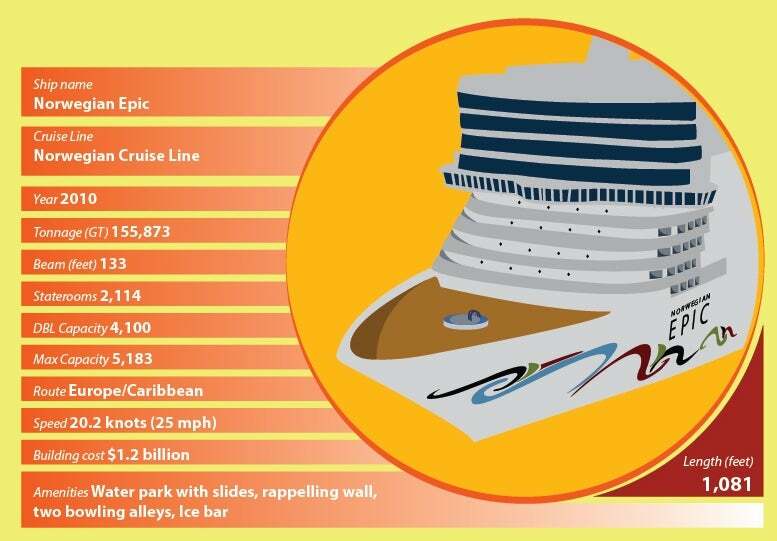 With a total of 19 decks, the ship can carry up to 5,183 passengers. It is 1,081ft in length and has a maximum beam of 133ft and draught of 28.5ft. The gross tonnage capacity is 155,873t. A powerful propulsion system consisting of six Caterpillar diesel-electric engines and six Wärtsilä thrusters, drive the vessel to a maximum speed of 20.2kt. Accommodation facilities include 2,114 staterooms in different categories such as deluxe suites, family villas, family mini suites, spa suites, pent houses and a studio, apart from balcony and inside accommodations. Epic Theatre, the onboard conference theatre, accommodates 681 guests. Freedom of the Seas, Independence of the Seas and Liberty of the Seas are three Freedom class cruise ships owned and operated by Royal Caribbean International. The ships were built by STX Europe’s Turku facility in Finland. Freedom of the Seas, the first among the three ships, sailed for its maiden voyage in May 2006. Liberty of the Seas has been in service since May 2007. Independence of the Seas was brought into service in May 2008 and refurbished in April 2013. Each ship is 1,112ft long and has a draught of 28ft. The beam of Freedom of the Seas and the Liberty of the Seas is 185ft, whereas that of Independence of the Seas is 183.4ft. The gross tonnage capacity of all the ships is 154,407t. Propulsion is provided by six Wärtsilä 46 V12 diesel engines, rated at 12.6MW, three ABB Azipod units and four bow thrusters. The cruising speed of each ship is 21.6kt. Each ship has 1,817 staterooms distributed across 18 decks. It includes 1,084 Ocean view staterooms, of which 842 are with balconies, and 733 interior staterooms among which 172 offer promenade view. A total of 4,375 passengers can be accommodated. Passenger amenities include a solarium, surf simulator, boxing ring, mini-golf, ice skating rink, casino and theatre. 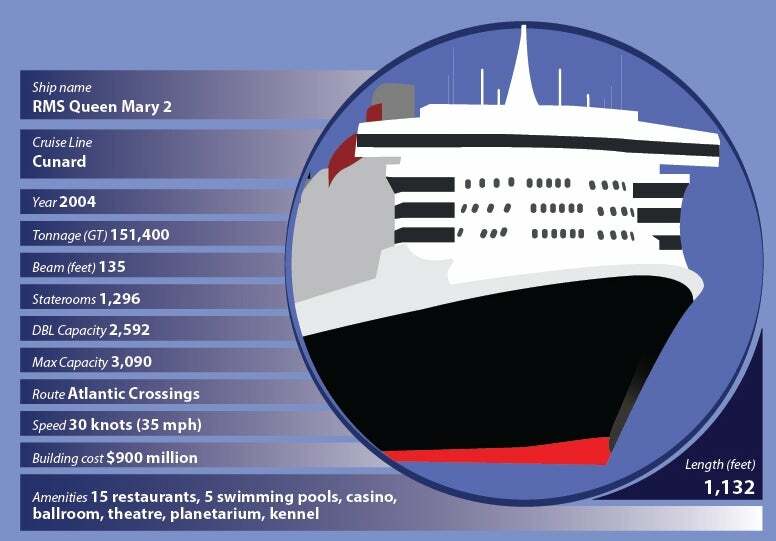 Queen Mary 2 (or QM 2), built at a cost of $900m, is the largest ocean liner ever built since the Queen Elizabeth 2 in 1969. The QM 2 entered into service in January 2004 as a flagship of Cunard Line and currently sails on transatlantic voyages between Southampton and New York. The 151,400grt ship is 1,132ft long and 135ft wide. It cruises at a maximum speed of 30kt carrying up to 3,090 passengers and 1,238 crew. The cruise liner features spacious interiors and an array of passenger facilities, such as restaurants, casino, a 3D Cinema, planetarium and a magnificent spa. It has 1,310 staterooms, including 955 rooms with balconies. Each stateroom is furnished with king-size beds, television, telephone, refrigerator, air conditioning, hair dryer and bathroom with shower. Norwegian Breakaway is the first of two Project Breakaway cruise ships built for Norwegian Cruise Line (NCL). The ship was introduced into service in April 2013 and currently sails to Bermuda, Southern Caribbean and the Bahamas, as well as Florida. It is the biggest cruise ship ever homeported in New York. The cruise ship has a gross registered tonnage of 144,017t. It measures 1,062ft in length and 130ft in width. The passenger capacity in double occupancy is 4,028, while the crew size is 1,505. The vessel sails at a speed of 21kt using diesel electric propulsion. Norwegian Breakaway boasts of the Waterfront, an industry-first quarter-mile oceanfront promenade. 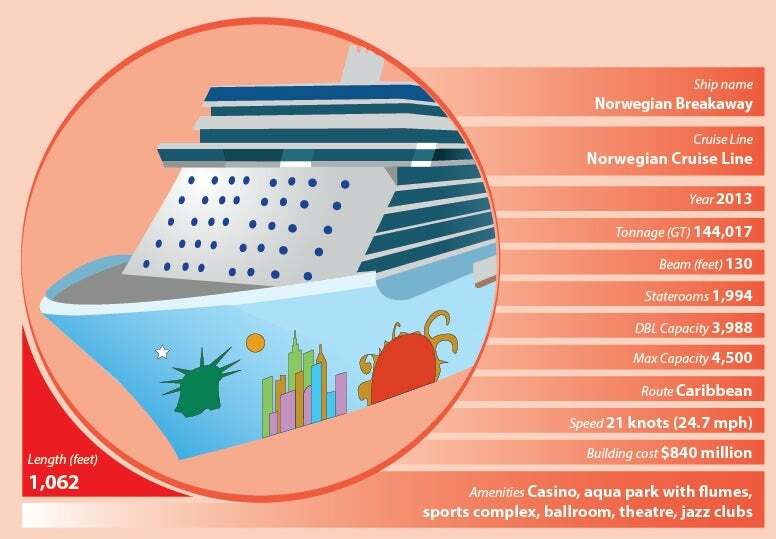 The ship also features a ballroom, Aqua Park and variety of entertainment venues. Adventure of the Seas, Explorer of the Seas and Voyager of the Seas are three identical cruise ships in the Voyager Class operated by Royal Caribbean International. The three ships entered into service between 1999 and 2001. Each ship has a length of 1,020ft and beam of 157.5ft. 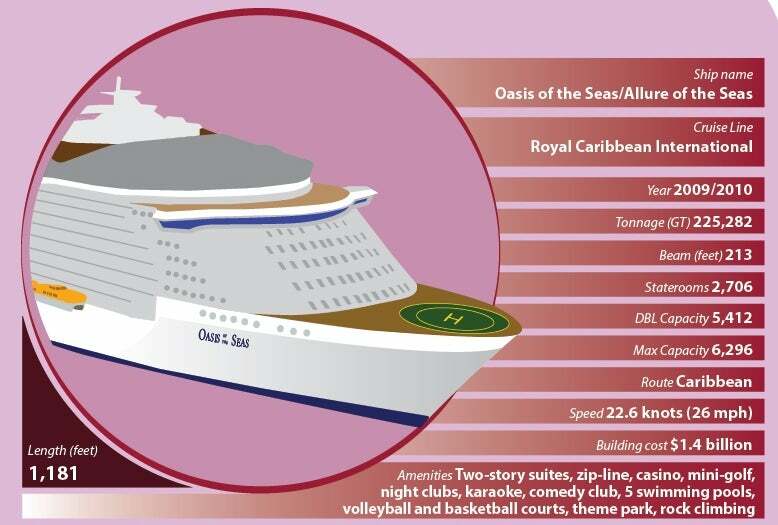 The gross tonnage of Adventure of the Seas is 142,000t, while that of the other two ships is 138,000t. All the three ships cruise at a speed of 22kt. Each Voyager Class ship can accommodate 3,114 passengers and 1,185 crew. 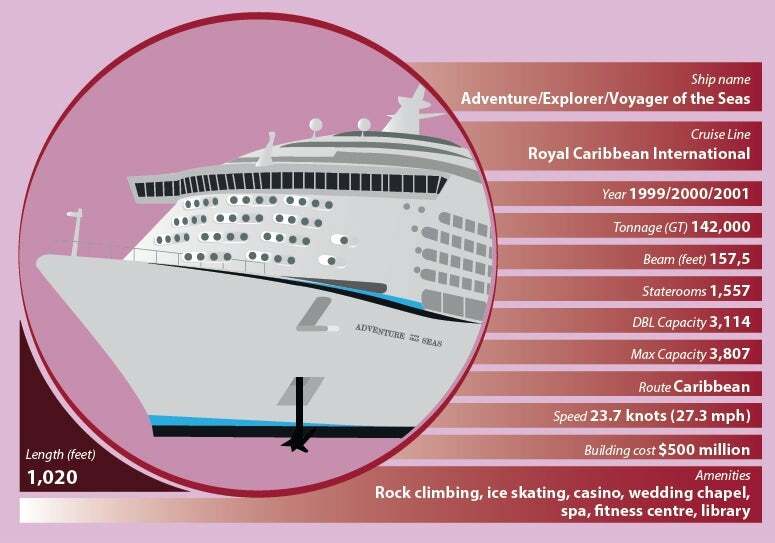 Each ship features a big promenade called the Royal Promenade, ten pools and whirlpools, 15 bars clubs and lounges, an ice skating rink, theatre, rock-climbing wall and a miniature golf course. MSC Divina and MSC Preziosa are two identical cruise ships of the Fantasia-class operated by MSC Cruises. MSC Divina entered service in May 2012, while Preziosa was introduced in March 2013. Both ships operate on Mediterranean voyages. The Divina measures 1,092.5ft in length and 124.7ft in width, with a gross tonnage of 139,400t. It can sail at a speed of 23kt and can carry 4,345 guests and 1,388 crew. The staterooms are offered in interior, ocean-view, balcony and suite configurations. Both the vessels feature multiple restaurants, bars, a casino, an infinity pool, Aurea Spa, Aqua Park, whirlpools, a bowling alley, "4D" cinema and a Formula 1 simulator. Mariner of the Seas and Navigator of the Seas sailing in the Caribbean are two second-generation Voyager-class cruise ships owned and operated by Royal Caribbean International. The ships were built at Kvaerner Masa yards, Turku, Finland. Navigator of the Seas has been in service since December 2002. Mariner of the Seas sailed for its maiden voyage in November 2003. Both ships are 1,020ft in length and have a beam of 157.5ft and draught of 29ft. The gross tonnage capacity is 138,273t. The propulsion system includes six Wärtsilä 12V46C diesel engines, three electric 14MW Azipod units and four 3MW bow thrusters. The cruising speed is 22kt. Each ship features 15 passenger decks, accommodating up to 3,807 passengers in 1,557 staterooms. The rooms include 939 ocean view staterooms, of which 775 are with balconies, and 618 interior staterooms, including 138 promenade view rooms. Wheel chair access is provided in 26 staterooms. Some of the common amenities include outdoor movie screening, spa, rock climbing, ice skating and nightclubs. MSC Fantasia and MSC Splendida are two Italian style Fantasia class cruise ships owned and operated by MSC Cruises, a division of the Switzerland-based Mediterranean Shipping Company. MSC Fantasia entered service in December 2008. Its sister ship MSC Splendida sailed for maiden voyage in the Mediterranean in March 2009. Both ships were built by STX Europe at its St Nazaire shipyard in France. Each ship is 1,093ft in length and has a beam of 124ft. The gross tonnage capacity is 137,936t. Five Wärtsilä diesel engines with a total output of 71.4MW, two 20.2MW electric motors and two fixed propellers with conventional shafts power each ship to sail at a cruising speed of 21kt. The cruise ships feature 1,637 staterooms spread across 13 decks. The staterooms include 1,256 cabins and suites with private balconies. Common amenities include four restaurants, spa, four swimming pools, squash courts, F1 simulator and a solarium. MV Ventura is a Grand-class cruise ship operated by P&O Cruises. It was built by Fincantieri and entered service in April 2008. It currently sails to Mediterranean, Northern European and Caribbean destinations. 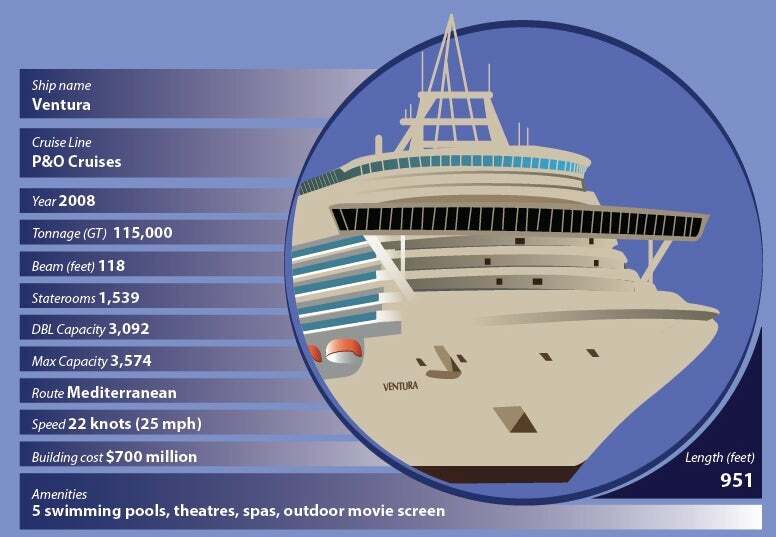 The Ventura has a gross tonnage of 115,000t and is one of the largest cruise ships in P&O’s fleet. It measures 951ft in length and 118ft in breadth, with a service speed of 22kt. It can accommodate 3,078 passengers in regular configuration, whereas the maximum passenger capacity is 3,574. Its guests are served by a crew of 1,226. The ship offers 1,539 cabins, of which about 60% feature private balconies. The accommodation is majorly classified into AE grade suites, superior deluxe balcony cabins, balcony cabins and outside and inside cabins. Royal Caribbean International is by far and away the leader when it comes to the world’s most expensive cruise ships, operating most of the top 10, including the whopping Allure and Oasis of the Seas. Seven of the 10 biggest ports in the world by cargo volume are in China. The remaining three are in Singapore,the Netherlands and South Korea.